The MOFI3500-3GN Version 2 is the most powerfull fully supported router that supports many of the 3G/4G/LTE intenet sticks around the world. What makes the MOFI3500-3GN the most popular and highly recommended product is the stability. Once a connection is made, the advanced custom designed software that Mofi Network Inc. created helps to maintain the fastest and most reliable connection. Share up to 255 simutanuous connections, wired or wireless just by placing the internet stick in the back of the router. Many other products may only allow 5 connections but the MOFI3500-3GN can allow much more and also offer the network RG45 hard connection for any devices such as ip phones, playstation, xbox and other devices that needs a fast stable connection. 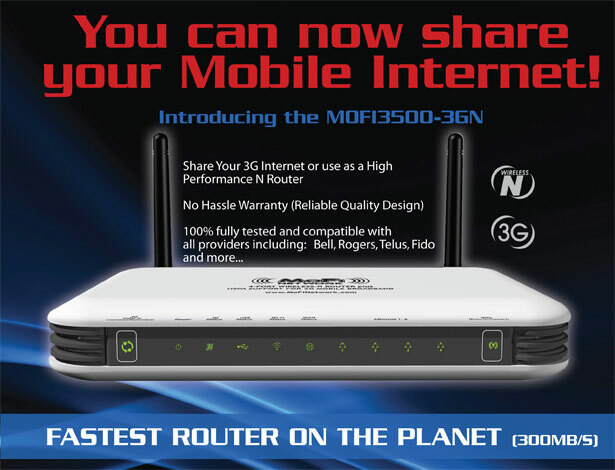 MOFI3500-3GN also integrates router function so that Internet can be accessed through WIFI connection simultaneously. MOFI3500-3GN 4-port wireless-N router function provides an excellent solution for sharing a wireless Internet connection and files such as High Definition (HD) video, music, photos and documents with the wireless speed up to 300Mbps. MOFI NETWORK MOFI3500-3GN creates a secure Wi-Fi® network by supporting the latest wireless security features to prevent unauthorized access. It supports for 64/128-bit WEP, WPA, and WPA2 to ensure that you will be able to secure your Wi-Fi network, regardless of your client devices. In addition, the 3G\4G\LTE Mobile Router utilizes dual active firewalls (SPI and NAT) to prevent potential attacks from across the Internet. The product integrates with smart MIMO technology which overlays the signals of multiple radios that can successfully reduce “dead sports”, increase in throughput and increase the wireless coverage range. By connecting a HSDPA/HSUPA USB modem into the USB Host port of MOFI3500-3GN, surfing the internet can be accessed and shared virtually anywhere within a wire or wireless broadband network. You can also directly connect Ethernet-based devices to its built-in 4-port full-duplex 10/100 switch. Dual function as 3G/4G/LTE mobile broadband router and 4-port wireless-N routerr. Share the internet with 1 internet 3G/4G stick by just plugging in the back of the router, share up to 255 users!!! Supper Fast (wireless speeds up to 300Mb/s full N speeds) up to 1000 ft range. Convert single user 3G/4G/LTE USB modem into a multiple users ready Wi-Fi Router. Wireless bridge function that allow to take the internet off wireless and send to your network port. Free Technical Support Toll Free and many more feauture included that is no listed here. NOTE : Specifications subject to change without prior notice.